Our DT-5RL panel mount tachometer offers a high accuracy rate (0.01% F.S.) usually found in more expensive models. With a 5 digit LED display, this unit is designed to fit a 1/8 din panel cutout. 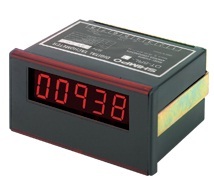 The DT-5RL is scalable, enabling it to read and display rotational (RPM) and linear speeds. One year warranty.